Two new additions to the ever-growing and rather-large Cube Collection. Today we have the Flower Rex Cube by LanLan and the same brand’s Face-Turning Octahedron. The weirdest thing about these two is how they share the same core. Due to this, their solution isn’t far removed from one another. That’s a good and a bad thing. Good for ease, bad for diversity. This is particularly true because I don’t find them overly fun to solve. It’s more of a chore (so far. 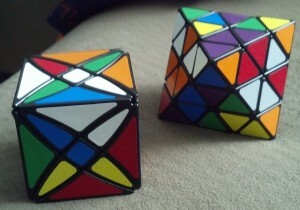 I haven’t solved the Octahedron yet) and not as much of a challenge as it is a task. However, I don’t care…they were both cheap (~$12 each) and they’re great additions! Now, order #2 is coming and I’m psyched about this one! It’s Calvin’s 2x4x6 – an ultimate shape-shifter! This should be cool! More soon! Oh, solutions might help – if and when I forget how to solve these guys!